Fraction charts are useful to show fractions and their equivalents. 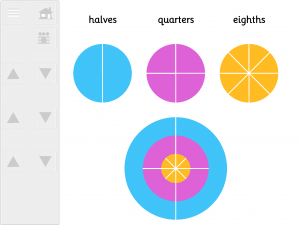 This resource does this using traditional horizontal fraction bars and the pie-chart-style ones shown. Toggle between the two types and adjust which fractions are shown. Go to fraction board teaching resource. This resource is part of the Numeracy Basics app available on the iPad app store.